Of Piccioni's 1970s material, this is one of our favourite albums. It mixes his trademark loungey jazz style with an updated, tight 70s jazz-funk backbone. There are two outstanding tunes on here, the lovely downtempo mellow funker 'Conjectures' and the jazz-funk groover 'Magic Of New York'. Either way, it's a strong album and well worth finding. 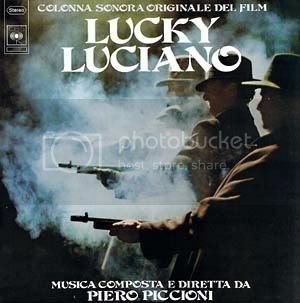 Huge thanks for the Lucky Luciano film soundtrack by Piccioni. I am a big fan of the film so finally discovering a soundtrack was released is total joy! If you want to know one aspect of the mosaic that forms the secret history of the 20th century, namely the interface between trans-national criminal networks, military and state run intelligence agencies and the politics of fascism and reactionary Catholicism then this film provides a fascinating insight into this hidden thread.